This bull was in the St Croix Valley Bull Test. He caught a bug that went through the herd, he went off feed, fell behind and never caught up. Perfectly healthy since January but the set-back caused him to not gain enough to qualify and make sale, so he is for sale on farm. From a cow family with a long and well documented history of outstanding performance. 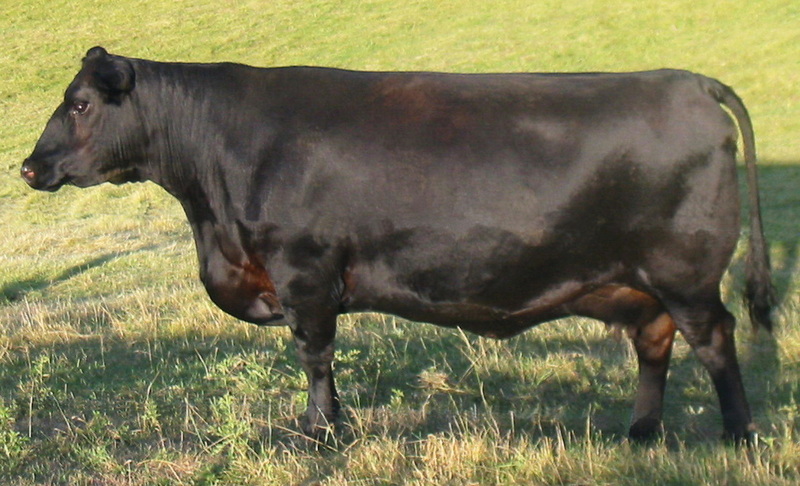 His Dam (Pine Hill Eva 215X) is a direct daughter to the legendary Bon View New Design 1407. She turned in a flawless growth & carcass performance with a 106 Weaning Ratio, 104 Yearling Ratio, 107 Marbling Ratio, 110 Ribeye Ratio. The FULL SISTER to his Dam (Pine Hill Brandy 12U) recorded a 106 Weaning Ratio, 111 Yearling Ratio, 126 Marbling Ratio, and a 108 Ribeye Ratio. Her Production Record reads: 4 calves with an average 103 Weaning Ratio, 3 calves @ 102 Yearling Ratio, 3 calves @ 115 Marbling Ratio, 3 calves @ 100 Ribeye Ratio. His Grand Dam (Shadow Creek Pride 202) is a cornerstone embryo donor cow in our herd, out of the great Hyline Pride cow family from the Raymond Van Dyke herd, in Bozeman Montana. 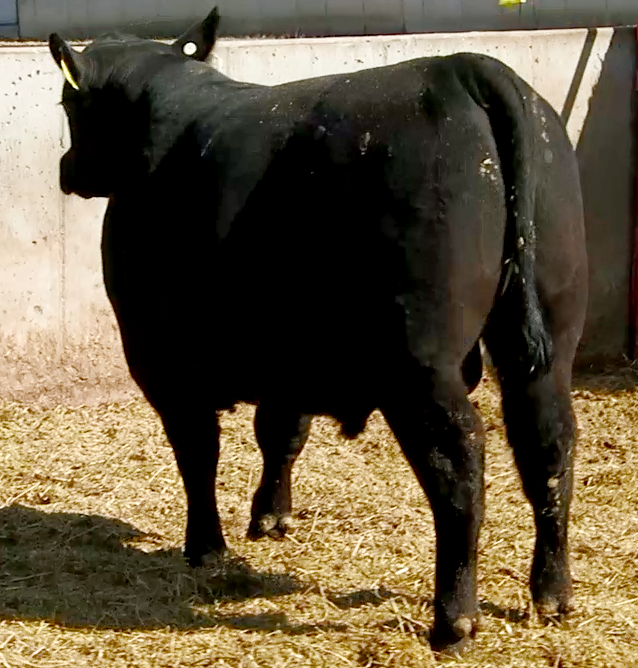 His Sire's pedigree traces back through the timeless Rito 6I6 "The Disposition bull" as well as New Design, Mytty In Focus and many other Angus legends. Click here to learn More about this Sire. 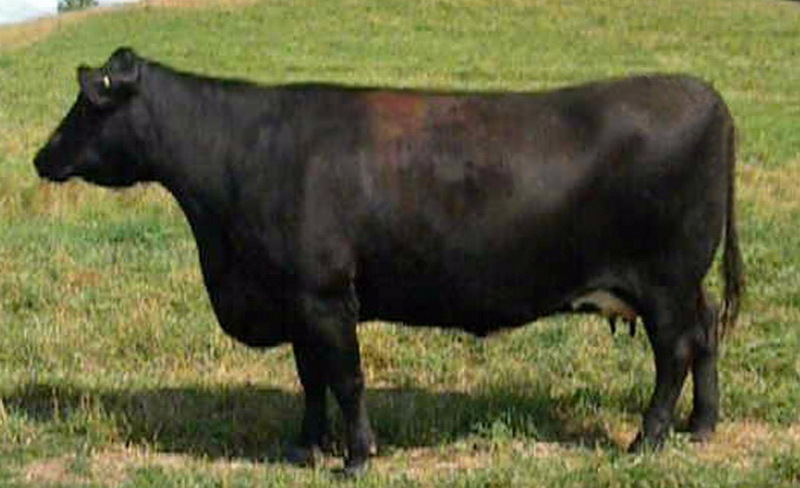 (Click Here for latest EPD's) American Angus Assoc. 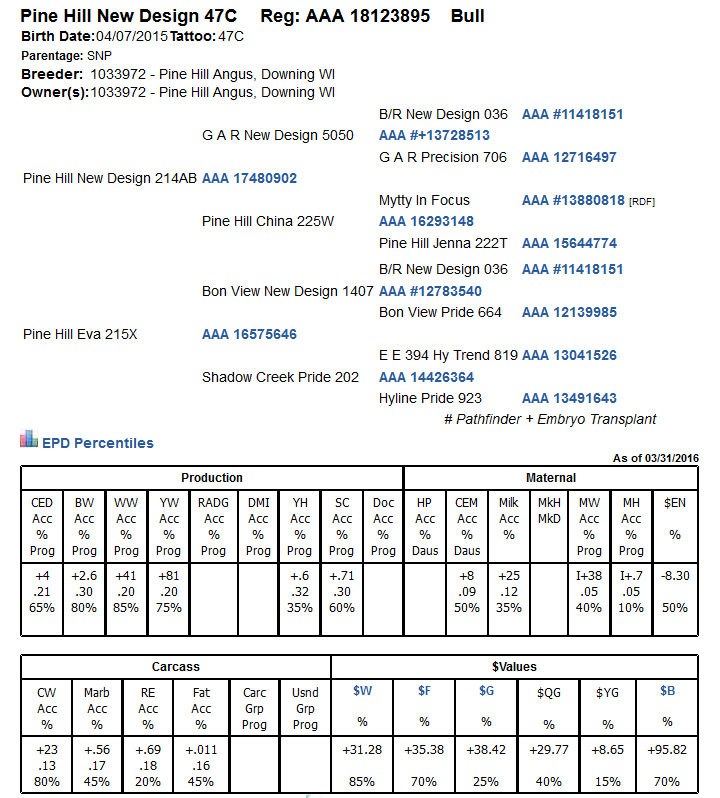 page, then click "search"
Sire: Pine Hill New Design 214AB. 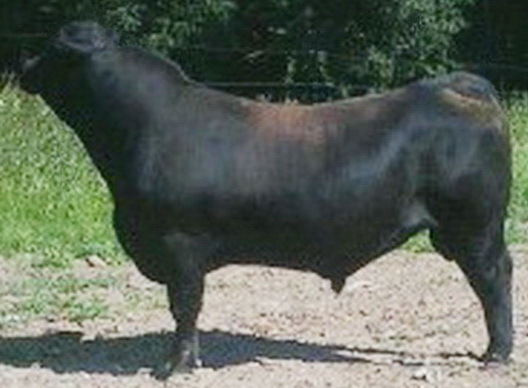 Here is a powerful Performance Bull that is a cross-over to a Calving Ease heifer bull. Breed leading EPD’s in all 12 important traits. He ranks below breed average for birth-weight without sacrificing growth. He is Parentage Tested and HD50k Tested to give you high accuracy Genomic-Enhanced EPD’s. His HD50k scores rank him in the Top 1% for Docility, Top 5% Feed Efficiency, and Top 25% or better for EVERY other trait. His Dam earned a 106 Weaning Ratio and a 108 Yearling Ratio. 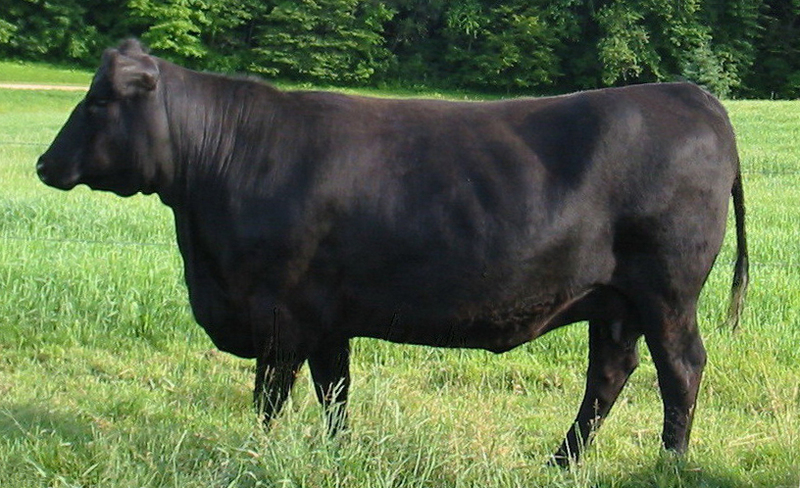 She is a big thick-made cow with a square hip and strong top with huge volume and rib shape. She shows 6 Pathfinders in an elite multi-generation pedigree stacked with A.I. Sires. She displays exceptional feet, legs & udder quality. Click here for pedigree & info on this Sire.